As NASA continues its internal review of the pending launch dates for the final two Space Shuttle missions in history, preparations are also continuing in earnest for the mission that everyone hopes will never be needed: the STS-335 flight to rescue the STS-134 crew in the event that Endeavour becomes disabled during the program’s final flight. As with STS-133 (Discovery) and STS-134 (Endeavour), the specific launch date for STS-335 is currently “Under Review” pending resolution of Discovery’s and Endeavour’s launch dates. Nonetheless, STS-335 would consist of a four member crew launching from LC-39A with External Tank 122, BI-146, and RSRM (Reusable Solid Rocket Motor) set 114. The mission would carry the MPLM (Multi-Purpose Logistics Module) Raffaello to the ISS during an 11+1+2 day flight to the International Space Station (ISS) that would both resupply the ISS with the consumables used during CSCS (Contingency Shuttle Crew Support) for the six-member STS-134 crew and return the STS-134 crew safely to Earth. If STS-335 were to become a reality, the Orbiter used for the mission would have all of her Cryo tank sets loaded to maximum, as well as a complete load of GN2 (Gaseous Nitrogen). Furthermore, the Orbiter would carry a half load of FRCS (Forward Reaction Control System) propellant and full ARCS (Aft RCS) and OMS (Orbital Maneuvering System) propellant loads. As always, Zaragoza, Spain would be the primary TAL (Trans-oceanic Abort Landing) site, with Moron, Spain and Istres, France as backups. The NEOM (Nominal End of Mission) landing would be targeted for KSC, with Edwards and White Sands as backups. Currently (as of May 4, 2010), STS-335 carries a projected Ascent Performance Margin of 6,075 lbs and all weight requirements/constraints are well within limits for NEOM, TAL, RTLS (Return To Launch Site) abort landing, AOA (Abort Once Around) landing, and a Contingency Return landing. 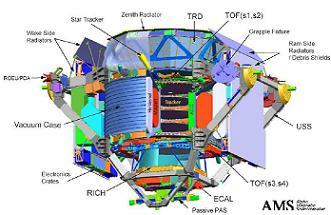 Furthermore, the Orbiter will carry 102 lbs of aft ballast, the empty weight of the aft ballast boxes. For a RTLS abort, a 185-second ARCS and 25-second FRCS propellant dump would be performed to configure the Orbiter to a proper Center of Gravity (CG) for landing. Likewise, a 120-second ARCS and 65-second FRCS propellant dump would be required for a TAL landing. Additionally, the standard FD-2 (Flight Day 2) OBSS (Orbiter Boom Sensor System) TPS (Thermal Protection System) inspections, FD-3 R-bar Pitch Maneuver with ISS photography, and late-inspections of the rescue Orbiter’s TPS would be performed, as well as any Focused Inspection that might be necessary. Under the original launch schedule and manifest, shuttle Atlantis (OV-104) was tapped to be the rescue LON (Launch On Need) orbiter for the STS-335 mission, as she could be turned around from her STS-132 mission for support a STS-335 launch date of November 29, 2010 – roughly two months after the planned September 16 launch of STS-133/Discovery (which was the original final flight of the Space Shuttle Program). However, with the swap in launch order of STS-134 (Endeavour) and STS-133 (Discovery) due to payload issues with the Alpha Magnetic Spectrometer for STS-134, the current launch manifest now stands in flux, with STS-133 in September (more likely late-November) and STS-134 in November (more likely late-February 2011). 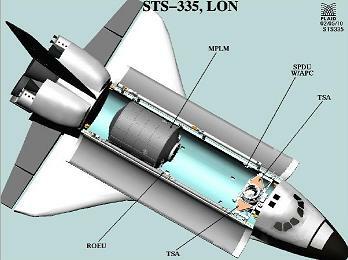 This calls into question the original plan to use Atlantis as the STS-335 LON vehicle as she was originally selected because she was the only orbiter that could have been prepared in time for a November 2010 launch of STS-335. However, with the slip of the manifest, and the now-unavoidable situation of flying 335 (if required) in calendar year 2011, there is now enough time to prepare both Atlantis and Discovery for duty on STS-335. While Atlantis – according to program managers and the KSC support teams – is still the LON orbiter for the final flight, internal multi-flow processing charts for all three orbiters (obtained via the STS-133 LSFR) show Atlantis’ processing status after STS-132 as “UNDER REVIEW” while Discovery and Endeavour continue on nominal processing timelines for September and November launches, respectively. Additionally, Shuttle Launch Integration Manager Mike Moses confirmed in the post-landing press conference for STS-132 that the processing teams – as part of their standard work – are looking at numerous options for finishing out the shuttle manifest (including STS-335). “Right now, the teams are off looking at our options. For the three flights we’ve got left, including STS-335, they’ve got about 15 options we could use,” notes Moses. In detail, part of the discussion surrounding Atlantis’ use on STS-335 is the fact that she is, at this point, due for a mandatory OMDP (Orbiter Modification Down Period) – a costly and intrusive inspection period each Shuttle Orbiter is required to go through every 5.5 years. In fact, Atlantis was originally scheduled for retirement in 2008 following her role in the flagship STS-125 flight (a mission that eventually flew in May 2009) because of a then-pending OMDP requirement. However, thanks to an impressive review of all OMDP records from the Space Shuttle Program, NASA mangers were able to revise the OMDP requirement periods for the three remaining Orbiters and allow Atlantis to fly two additional missions after STS-125. Once again, though, the OMDP year-interval limit has been reached for Atlantis and she is once again due for an OMDP. Naturally, since crew safety is paramount – and Endeavour could not be prepared for STS-335 (back when STS-134 was to fly in late-July 2010) in time for launch by November 2010 – Atlantis was selected as the LON vehicle and a plan was drawn up to work around her mandatory OMDP requirement in order to preserve crew rescue capability for the final program flight while still ensuring Atlantis’ safety for flight. In short, this plan required the deferral of certain mandatory inspections and procedures of Atlantis’ more unreachable areas. Specifically, the STS-335 LSFR notes that “Nominal Time Age Cycle Items will have to be performed prior to the 33rd flight of OV-104,” such as the completion of Wing Leading Edge Spar structural corrosion inspections — which requires the removal of several RCC (Reinforced Carbon-Carbon) panels during the OPF flow. “In addition, the following Structures and ECL requirements will be due and are very intrusive in that they drive radiator and waste tank removals: Radiator Hinge Inspection Requirements [and] the requirement to flush the waste water tank with nitric acid is due prior flight 33,” notes the 335 LSFR document. While the 335 LSFR notes that rationale could be found and approved to extend these two requires past OV-104’s 33rd flight, five “non-extendable OMDP Requirements” would have to be completed before Atlantis could be cleared for flight on STS-335 – requirements that would not have to be performed on orbiter Discovery since she is not yet due for an OMDP. While a firm decision on the shuttle launch manifest (including target launch dates and which orbiter will be called upon for STS-335) is expected sometime this month, the 335 LSFR outlines the work that would need to be completed on Atlantis, should NASA managers choose to move forward with her as the 335 vehicle. The most extensive work noted by the LSFR (which does not include reference to the five “non-extendable OMDP requirements”) is the WLE spar structure corrosion inspections. Among the mandatory work here is the installation of two rivets to the spacer “on the installed rib splice #1 spar fitting on the left hand side to complete the deferred rivet installation,” notes the presentation. This addition of two rivets to the spacer on rib splice #1 spar fitting is part of an ongoing two-year effort to inspect and upgrade Atlantis’ WLE spars. Since a complete inspection of Atlantis’ WLE spars could not be accomplished during a single OPF flow due to Atlantis’ mission’s (STS-125 and STS-129) launch dates, and inspection could not be complete in the two month time period between STS-129’s predicted landing and the requirement due date, WLE spar inspection began during OV-104’s flow toward STS-129. “[Twelve] RCC panels and required Spar fittings were removed during the STS-129 flow to perform sampling inspections – Panels 12L-16L and 10R-16R,” notes the LSFR presentation. No active corrosion was found during those sampling operations. With those inspections, ~75% of Atlantis’ WLE spars were inspected and found to be in “very good” condition. With this information, a Delta PRCB (Program Requirements Control Board) meeting on March 3, 2010 approved a waiver to defer inspection of Atlantis’ remaining WLE spars until after STS-132. 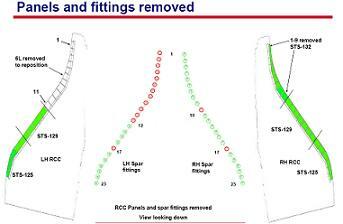 Thus, a detailed inspection of Left Hand RCC panels 1 – 11 and associated spar fittings 1 – 11 is now required prior to acceptance of Atlantis for flight on STS-335. Completion of these inspections will leave a total of only four spar fittings un-removed and uninspected: spars under panels 17L/R, 12L, and 10R. 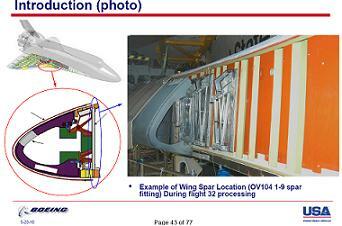 A waiver will be presented to the PRCB for “approval of an Exception” that will clear these OV-104 spars for flight. In addition to this work, a TPS Ceramic Plug/Insert redesign will be applied to Atlantis for all of her 0.75″ diameter plugs and 0.875″ shorter diameter plugs. “Redesigns ceramic plug sleeving/retainer for all 0.75″ diameter plugs & 0.875″ shorter diameter plugs (0.75″ length and less) to increase cord thickness to meet the installation torque requirements,” states the LSFR document. Furthermore, additional TPS work for Atlantis will include OMRS required inspections of her Elevon coves (requiring the removal of end panels and center panels in order to perform Borescope inspections), removal of 28 LESS carrier panels for perimeter GF rework (on panels L19, RH8, R21, and R22), and a “re-waterproof” of all upper surface TPS blankets on the midbody sidewalls, Payload Bay Door sidewalls, and Upper Wings. 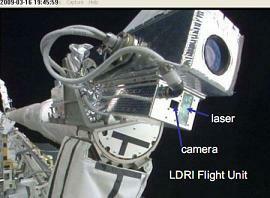 Additionally, flight of Atlantis on the STS-335 mission will require cannibalizing parts of the OBSS (specifically the LDRI – Laser Dynamic Range Imager) from Discovery following completion of the STS-133 mission. The ability to take Sensor Package 1 from OV-105’s OBSS is no longer an option since the STS-134 crew will leave Endeavour’s OBSS on the ISS at the completion of their docked mission. As such, Sensor Package 1 will now have to come from OV-103’s OBSS post-STS-133.